LaunchPad Solo for Literature, a set of customizable online materials, helps beginning literature students learn and practice close reading and critical thinking skills in an interactive environment. Easy-to-use and easy-to-assign modules based on widely taught literary selections guide students through common assignment types: responding to a reading, drawing connections between texts, instructor-led collaborative close reading, and listening to a text. In addition, students and instructors have access to a library of texts and nearly 500 reading comprehension quizzes on commonly taught literary selections along with several engaging videos by well-known authors on literary elements such as character, dialogue, and voice. Get all our great resources and activities in one fully customizable space online; then use our tools with your own content. 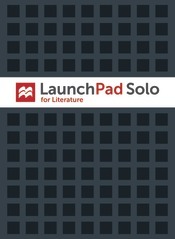 LaunchPad Solo for Literature can be used on its own or packaged with one of our literature titles at no additional cost.